The TSC TA300 has been discontinued. No direct replacement is available. 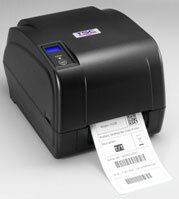 4" Desktop 300 DPI thermal transfer label printer superior, affordable performance. The TSC TA300 reinvents the definition of value for low cost desktop label printers. The price of the TA300 may be inexpensive, but it looks and performs better than its expensive competition. The TA300 features two durable gear-driven motors that are capable of handling large capacity 300 meter ribbons and large rolls of media inside its sleek design. If the 5" interior label capacity is not enough, simply add an external media unwinder and the TA300 can easily handle 8.4" outer diameter rolls of labels designed for expensive industrial label printers. The print mechanism and ribbon handler of the TA300 is a modular design and easily removed. These virtually trouble free units feature a standard two-year warranty. Once you plug it in, you won"t have to worry about it.